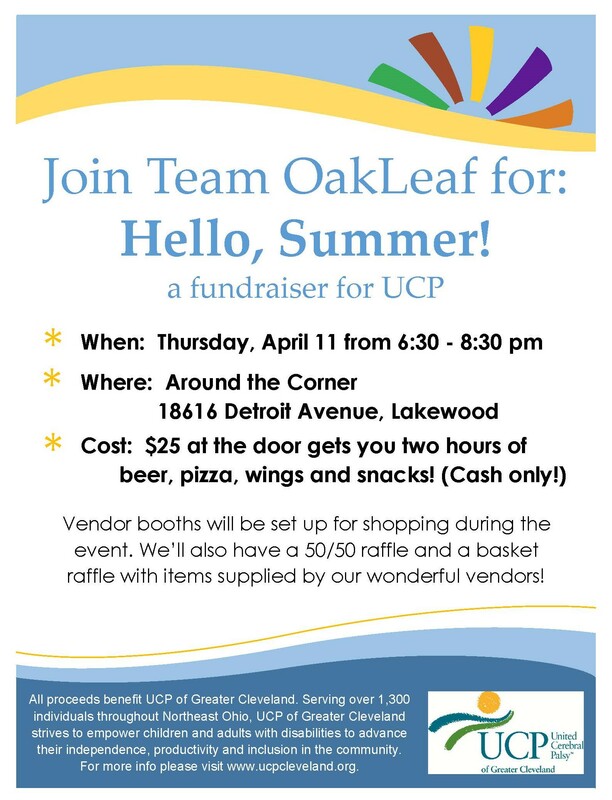 Join Team OakLeaf for “Hello, Summer!” a fundraiser for UCP. For $25 at the door (cash only), you get two hours of unlimited beer, pizza, wings, veggie tray and snacks! Vendor booths will be set up for shopping during the event. We’ll also have a 50/50 raffle and a basket raffle with items supplied by our wonderful vendors. We hope to see you there! Hello and thank you for your interest. Sorry for the confusion. For this particular event when we are talking about vendors, we mean vendors who sell goods such as jewelry, makeup and clothing. If we do an event with providers we will definitely keep you mind! Thanks!